Southern California's Blink 182 rode the late 90's pop-punk wave to become a pervasive force on the international music scene. Their strength lies in their ability to write highly melodic and catchy anthems for a disaffected MTV generation. Their often witty and heartfelt lyrics brutally depict the anxieties of middle-class teenagers. They talk, dress and act like the kids who buy their records, and much of their success can be attributed to their world-class music videos which combine sharp narrative, screwball comedy and often humiliating endings. 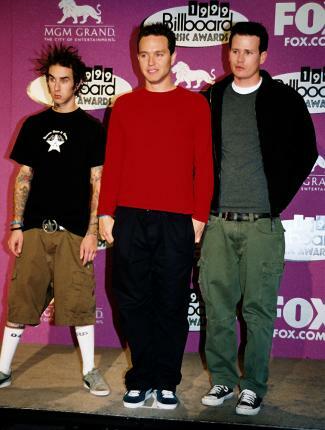 The original line-up, known as Blink, included bassist Mark Hoppus, lead guitarist Tom DeLonge, and drummer Scott Raynor. Blink toured tirelessly on the back of their self-released EP Fly Swatter in 1993, gaining notoriety for their comical, live shows and their tendency to take their clothes off in public. Their next release was Buddha which was put out only on cassette and limited to 1,000 copies. Buddha was reworked to make up much of the band's 1995 full-length debut, Cheshire Cat. 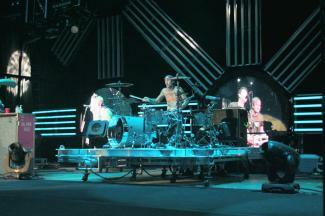 Long-time acquaintance of the band Travis Barker replaced Scott Raynor on drums in 1997, after Raynor returned to his studies. Soon Blink added the moniker 182, after being challenged by an Irish techno outfit that was also called Blink. Blink 182 had their first taste of commercial success with the album Dude Ranch (1997), which featured the hit single Dammit. Their relentless touring schedule increased with the resurgence of the global surf and skate scene. Blink 182's inclusion on the Vans Warped Tour, plus regular support gigs with punk legends Pennywise and NOFX, led the band's 1999 release Enema of the State to reach an entirely fresh audience. Another reason for the band's success with Enema of the State was the band's new producer, Jerry Finn. Finn had previous success with helping the careers of punk bands Offspring and Rancid. Soon after, The Tom, Mark and Travis Show (2000) signaled a maturity in production, while Take Off Your Pants and Jacket (2001) was evidence of a band truly in control of their songwriting. The album debuted atop US Billboard charts. Blink 182 released their self-titled fifth studio album in 2003. It was the band's first release for their new label, Geffen Records. The album reflected a more experimental direction for the band, with singles Feeling This and I Miss You topping the U.S. alternative music charts. Despite the success of Blink 182, the band issued a press release in February 2005 that announced their "indefinite hiatus." 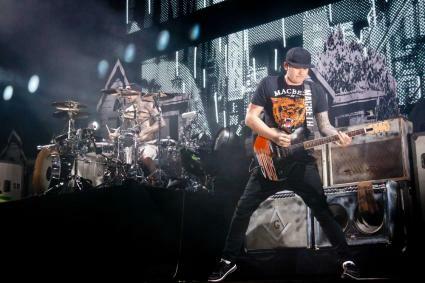 DeLonge disappeared from the public eye, while Barker and Hoppus continued to perform with their new project, +44. During this period Barker also embarked into reality television with the MTV series Meet the Barkers. 2008 turned out to be a bittersweet year for Blink 182. In August, longtime producer Jerry Finn suffered from a cerebral hemorrhage and later died. Barely a month later, Travis Barker and business partner Adam "DJ AM" Goldstein were involved in a plane crash. The crash killed four people, leaving Barker with second and third degree burns and post traumatic stress syndrome. Goldstein also survived, but died in 2009 from a fatal overdose of cocaine and painkillers prescribed for injuries sustained in the crash. DeLonge and Hoppus visited Barker in the hospital during his recovery, setting the groundwork for a reunion of Blink 182. In a 2010 Chicago Tribune interview DeLonge offered, "If that accident hadn't happened, we wouldn't be a band, plain and simple. That was fate." DeLonge, Barker and Hoppus announced their reunion while appearing as presenters at the 2009 Grammy Awards. Picking up as if they had never split, Blink 182 released a documentary film called The Blinkumentary and embarked on a North American tour supported by Weezer and Fall Out Boy. Neighborhoods, the band's sixth studio album, was released in September 2011 despite legal issues between band members and a self-proclaimed "loss of unity" during the recording process. The album peaked at #2 on the Billboard 200 chart. Blink 182 headlined the 10th Annual Honda Civic Tour with My Chemical Romance in late-2011 and launched their 20th Anniversary Tour in 2012. They also released a five-song EP in December 2012, titled Dogs Eating Dogs. In early 2013, the band toured Australia as part of the Soundwave Festival. Drummer Brooks Wackerman of Bad Religion filled in for Barker, who still suffers from a fear of flying related to the 2008 crash. New material in 2013 is a definite possibility. Blink 182's sound is big and brash, which reflects the bold personalities of the band members. Even though they don't always work together as a cohesive unit, their ongoing body of work encompasses clever lyrics, catchy riffs, and an attitude that speaks to an entire generation of fans.